Today is the first day of Spring -- that magical time of year when things green up again after the dreariness of winter. Bulbs are poking their noses above ground, trees have fat buds, and soon, very soon, the yard will be abloom. These are not from Linderhof's garden, alas, but rather from the market -- a $2.99 purchase which, when in a few short weeks we'll have an abundant supply, may seem like a silly purchase, but they make me smile and for that, it is worth it. 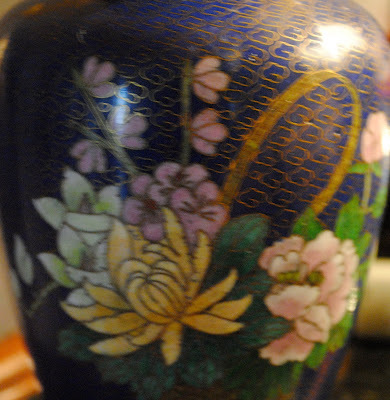 The vase is one of our cloisonne pieces. Actually, one of husband Jim's cloisonne pieces. He's the cloisonne collector. I just get the benefit! It's a newly acquired one, too. I love the colors. The blue background and the flowers in pink and violet and yellow and white. It's the perfect size for my bedside table -- replacing a blue and white vase that I once had there. This vase is more special -- a reminder of a trip and the pink in the vase picks up the pinks of the Master Bedroom. It's Saturday which means that it's Pink Saturday. Please join Beverly at How Sweet the Sound for Pink Saturday! Both your vase and your flowers are so lovely. Ah finally spring has arrived! I agree, your vase and your flowers match perfectly! Spring is here not a moment too soon for me! 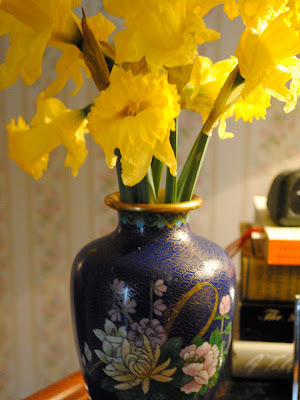 I love cloisonne and love the contrast in color with the daffodils! I think $2.99 is a small price to pay for a vase of happiness! :) Happy spring! 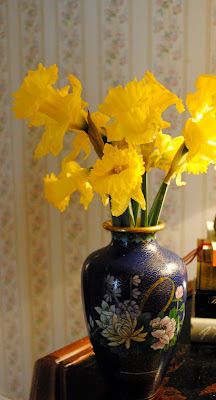 Your vase is gorgeous and those daffodils look absolutely perfect in that vase. What a lovely arrangement to have on your bedside table. They look lovely in that vase. Have a great weekend! The vase is beautiful, Martha and the perfect place for a bit of spring! I love daffodils! I wish our stores sold them. Thanks for the Guinness cake I copied it. Will try, just love Guinness! I don't think it's at all silly to buy daffodils when you'll soon have lots of your own. There's something quite wonderful about that first bouquet, before the flowers are thick on the ground. I'm happy to report that the buds on my daffodils are just about to burst open! Today we're in the 70's and if it would stay that way, they'd be open in a day or two. Unfortunately, the forecast is for highs in the 40s after rain tonight so I may have to wait a little longer for some pretty yellow blossoms like yours. I know it's supposed to be pinks today and all, and I do LIKE the pinks on your vase, but I LOVE LOVE LOVE your beautiful daffodils! So perfect for the first day of spring! Sorry for the late visit but I'm glad I could come and enjoy your great pinks!